Proper tooling choice is crucial to achieving optimal results in CNC cutting. Customers believe selecting the appropriate tooling dimensions is the only important aspect in determining cut edge quality. Unfortunately, tool choice selection is far more complex than a straightforward choice of dimensions. While many factors are involved in tooling choice, the single most important aspect that can significantly alter edge quality is whether an upcut or downcut to ol is used for the job. The difference between an upcut and downcut tool is simply the direction of the flutes. The flute is a groove that wraps around the tool where the chips are released from the cutting edge. This is an important concept to understand when it comes to tool choice. 1. What material are you cutting? 2. How thick is the material? 3. What finish is required? Upcut tools are not a common choice for cutting wood or particle board. Using an upcut tool would pull the wood chips out of the material and cause unwanted fraying. On the other hand, if the cut edge is not going to be visible, using an upcut tool is still a viable option. It allows you to use a faster spindle speed thus completing the job in a timely manner. When cutting wood, you need to find the right tool to optimize the use of your machine and obtain the desired finish. If the top edge of the workpiece is going to be seen, a downcut tool is recommended as it will push the chips away from the surface. 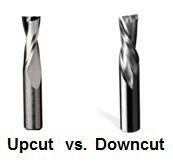 The only disadvantage to a downcut tool is that it requires a much slower spindle speed decreasing efficient workflow. The slow speed is needed as it takes much longer to get the chips out of the material that is being plunged into. Cutting with high-speed rates creates immense heat and can damage the tool which is why a lower spindle speed is necessary. When a smooth edge is required on both sides of the material, a compression bit can be very useful. The top end of a compression tool will give you a downcut while the bottom end gives you an upcut creating the compression as both flutes meet. In essence, this tool uses the upcut side to pull the chips out and the downcut side to smooth off both edges. For example, when cutting doors for a home, all the edges of the door slab are visible so a compression tool would be the optimal choice out of the three options mentioned.